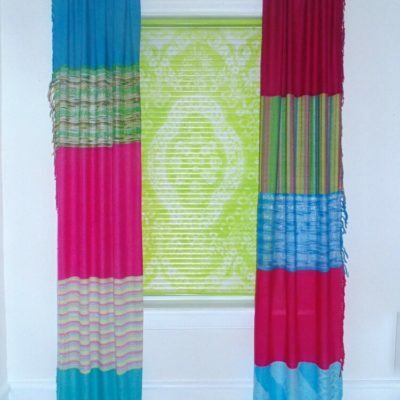 I love to use unexpected things for storage, and there are so many things that I see at the thrift stores that can be repurposed in fun and interesting ways. The traditional ceramic canister set that I had on the kitchen counter had to go. It just wasn’t the look that I wanted anymore. Actually it was never the look that I wanted, but I never got around to doing that makeover. Sound familiar? I hope I’m not the only one that happens too. The $5 thrifted set functioned perfectly fine so it just got put on the back burner, and after a while I just became blind to it. I think I got my money’s worth out of it though, and I’m sure the thrift store will find it a good home. 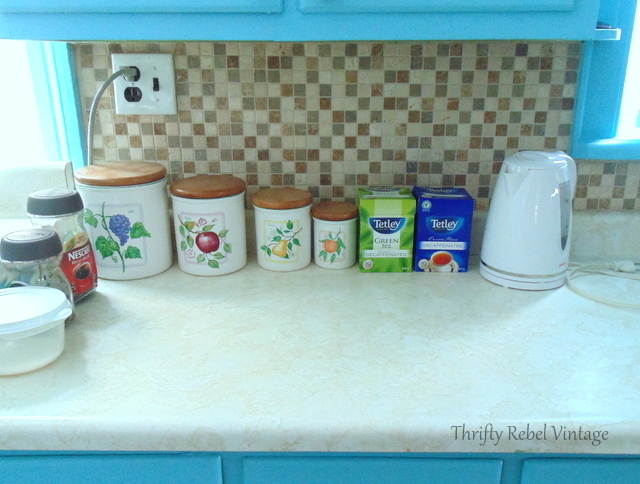 Here’s the fruit-themed set before the decoupaged kitchen counter and faux tile backsplash makeovers. The round plastic container was our sugar bowl. 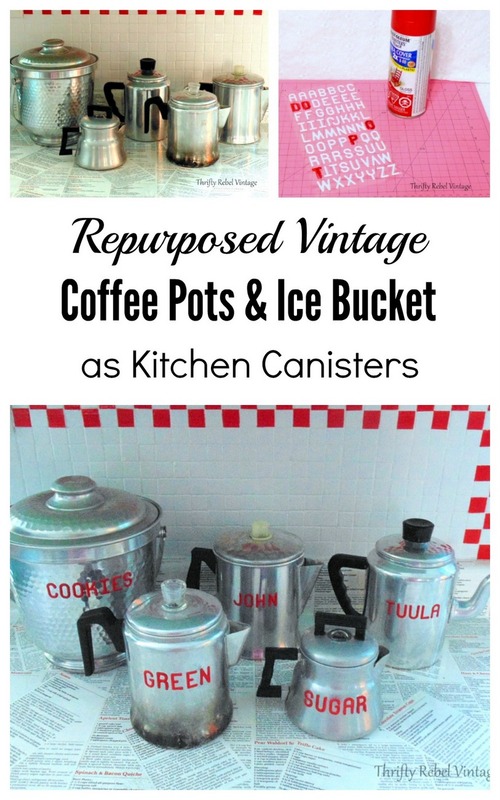 Here’s what I’m using to replace them… four 50 cent vintage coffee pots and a $1 vintage ice bucket. All from my craft studio thrifted stash. This 3D stick-on letter sheet that I found at the dollar store had perfect sized letters. I tried to colour them red with a red marker, but it wasn’t opaque enough for me… so I grabbed the red apple spray paint that I used on the hardware for my kitchen china cabinet makeover. And it really did the trick. 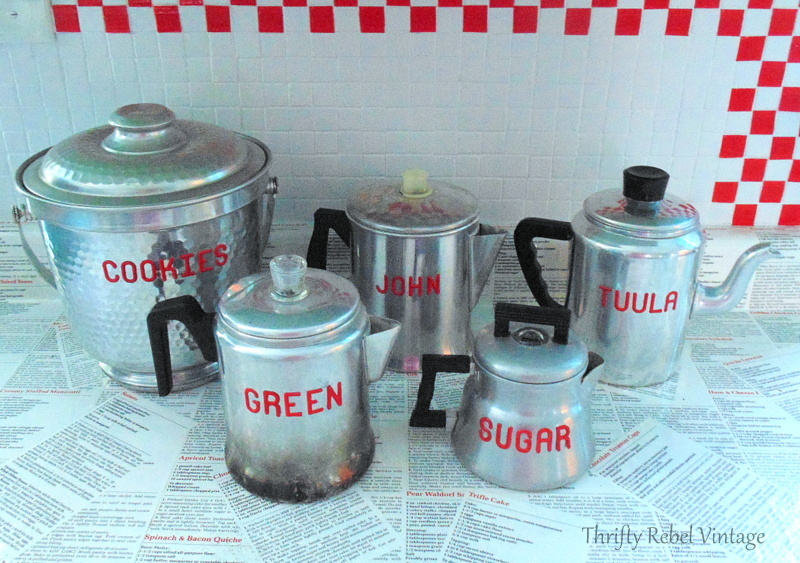 I’m using these vintage coffee pots to store decaf teas. To me that’s unexpected and fun. These coffee pots take up less space than teapots, and I love their look. The one on the left obviously had a lot of use back in the day. To me that’s great patina. My coffee pot holds Earl Grey Breakfast tea (which I enjoy anytime of the day actually), John’s holds Orange Pekoe, and the third holds green tea which I often drink as well. We do have regular caffeinated tea for guests, but it’s kept in the cupboard because it isn’t used every day, and John does drink decaf coffee occasionally. Maybe I should find a mini teapot to store his coffee. lol. Isn’t the mini coffee pot sugar container sweet? 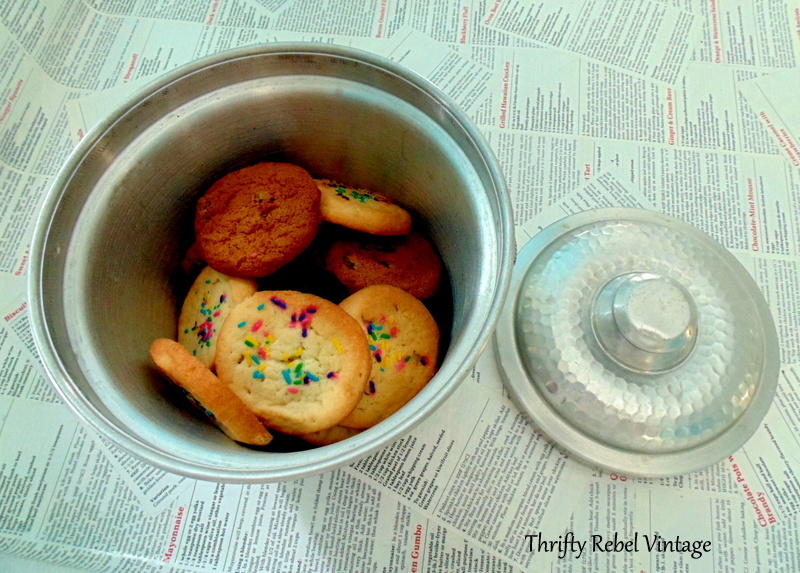 And the vintage ice bucket makes a fabulous cookie jar because it has an air tight lid. The little village close to us has an old style general store that also has a bakery, and we love to support them by buying fresh baked goodies… pies, brownies, tarts, and especially cookies. They package cookies by the dozen, and they’re only a little more expensive than what we’d pay at the grocery store. But for me the big plus is that they’re fresh baked and preservative free. I bake occasionally, but not as often as I’d like so we enjoy supporting our local little bakery. There aren’t many small town bakeries around here anymore. Really cute reurposing! Love the counter top. It’s so nice to have a good bakery nearby. Thanks Mary! I couldn’t agree more about the bakery. We’re lucky to still have a small town general store and we like to support it. Super super cute. Again… we can never find things like you repurpose here unless they are at pricey antique stores but super cutr anyway!! Thanks Rowena! It’s amazing how much great stuff gets donated to the local thrift stores around here, and they price their items to move them. Once I get to the bigger cities prices are often more than I’m willing to pay. Thanks Dona! I’m having so much fun getting all these past thrifted things out of my craft studio. They’re actually being used rather than just stored and waiting to be used. My craft studio is starting to feel like an inspiring place again. Creative and fun Tuula. Love this idea. Love seeing your creative counter tops too. That looks adorable! The cookie tin is very cool, I have the exact same vintage ice bucket on display (empty), and I never thought ‘airtight,’ but now it’s going to be called into action! Thanks Michelle! How fun that you have the same ice bucket. Isn’t it fabulous! It makes a perfect cookie jar. What a great idea!! I too have a “few” old coffee pots. 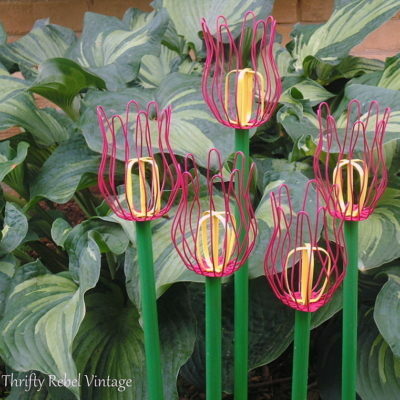 I was thinking of using them in my garden as planters….. Hmmm, I may have to rethink that idea! Thanks for the inspiration. You’re so welcome Patricia! Coffee pot planters are an awesome idea. 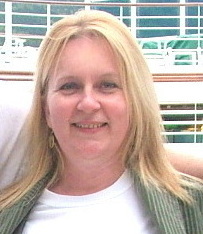 I did some years ago in the pre-blogging age, and I loved them. So clever and so cute! 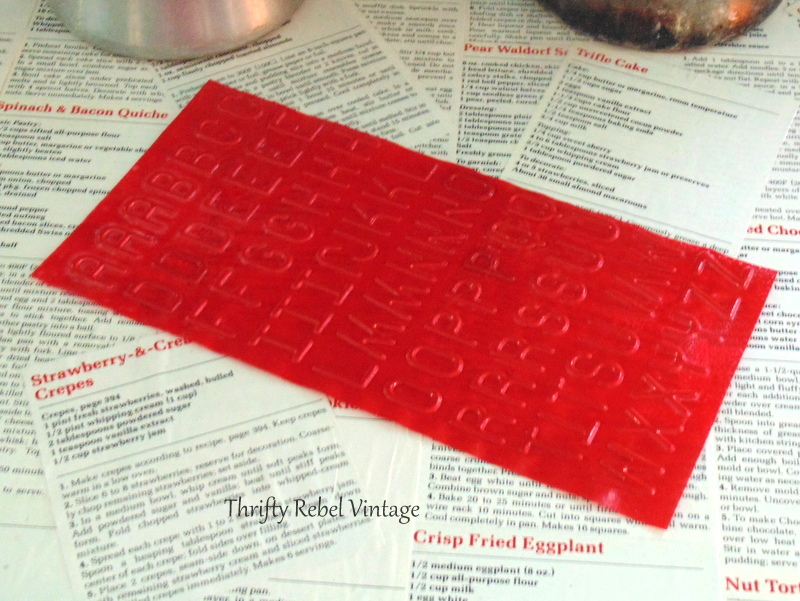 You are on a roll with such great repurposing ideas for your kitchen. Keep ’em comin’! Thanks AnnMarie! Will do. I’m really having fun with this kitchen makeover. Oh my gosh, you have the most creative ideas! These are so cute. 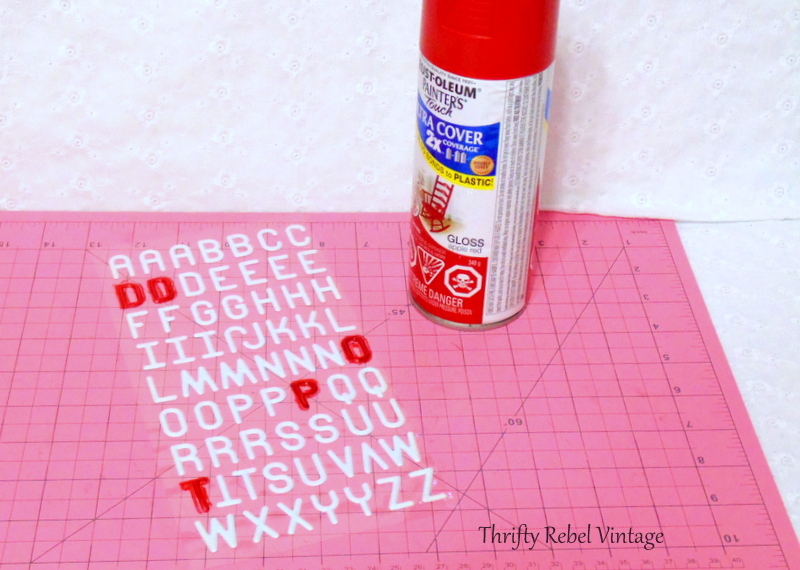 And I love that you spray painted the letters! That cracks me up. Hey, whatever works, right? I would never have thought to do that! Fabulous! The little coffee pots and ice bucket look so cute and they’re perfect for tea bags and cookies. Very clever! I think it’s great that you support the local bakery. Plus it’s better that everything is fresh and there are no preservatives. Thanks so much Judy! The truth is I couldn’t find red stick on letters that I liked so I had no choice but to paint them myself, and it worked. In my world necessity is often the mother of invention. Oh Tuula, that is super cute. I’m in love with the small coffee pot. You think out of the canister so well. Thanks Sharon! The little coffee pot is adorable, and I’m so happy to be using it in my kitchen. It just makes me smile. Love this idea. The ice bucket/cookie jar is my favorite. Thanks so much Kim! It definitely holds some of my favourite things… fresh baked cookies. Such a fun idea! The cookie pot is my favorite! Thanks so much Cecilia! The cookies are my favourite. lol. I am in love with this! You have got the wheels in my brain churning! OMG Tuula, you are killing me with this kitchen makeover! this is the cutest idea ever!! 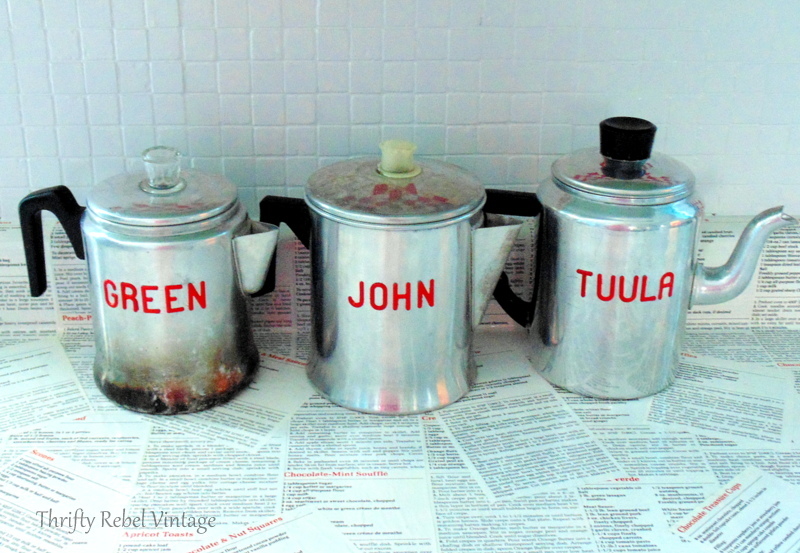 Love them vintage coffee pots and what you done with them by putting them to good use. They look Great in your kitchen. That ice bucket……….pure genius. Thanks so much Colleen! I do love the way they look, and it was so easy to do. 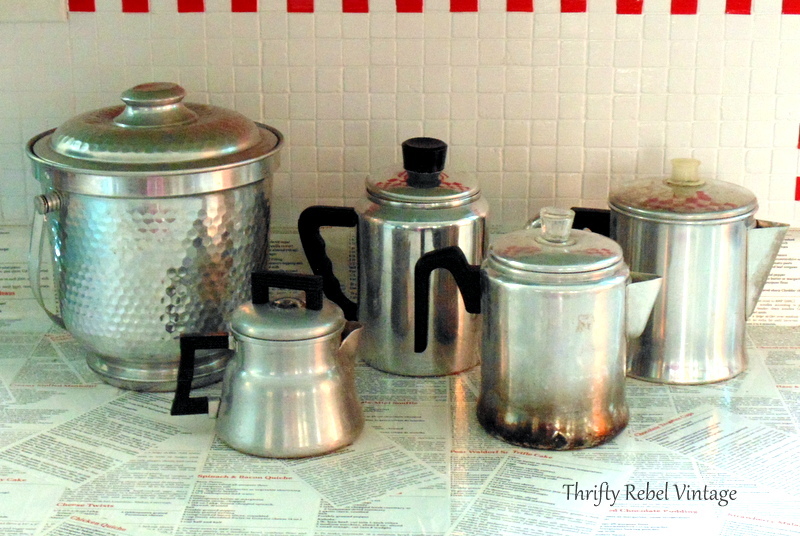 Thanks for sharing your adorable repurposed coffee pots at Vintage Charm! 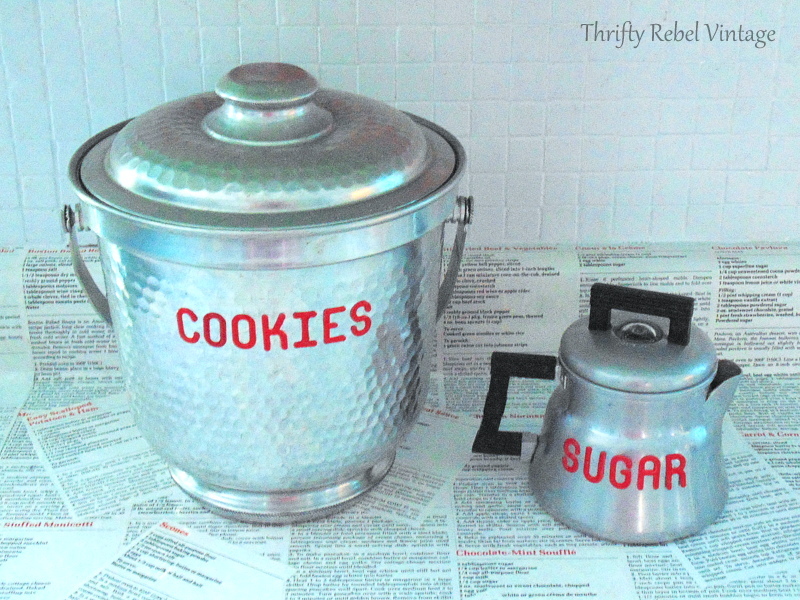 Tuula, those canisters are a great Idea for storing tea, cookies and sugar! I like how you’ve lettered them with red. They look wonderful!! I’ve been thinking about getting a new set of canisters, now you’ve got me thinking. Thanks for the inspiration!